Keep your clients comfortable and happy while reducing your massage linen cost by using Spa-Touch Flat Massage Table Sheets. 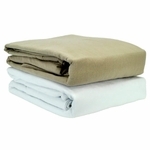 Double brushed microfiber � Breathable and as soft to the touch as the skin on a peach. The Spa-Touch Microfiber sheets have a super soft, peach-skin feel thanks to a specialized brushing process (also called �peaching� because of the resulting look and feel). These sheets are double brushed to feel as smooth and soft as 100% cotton T-300 sheets at a fraction of the cost. Microfiber sheets are more durable than 100% cotton and cotton-polyester blended sheets. 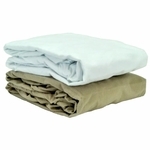 Not only are these wholesale microfiber flat sheets a great value up front, but the unsurpassed strength and durability of microfiber will allow you to keep the sheets in service for many more washes than cotton or cotton/polyester blend sheets. Compared to 100% cotton or cotton blended sheets, the Spa-Touch microfiber sheets use less water in the wash, require less time and energy in the dryer and come out of the dryer wrinkle free for quick and easy table set up. Mix and match 4 inviting colors in 2 lengths for complete client coverage. The Spa-Touch massage table flat sheets come in 2 lengths: standard massage table (64x94) and extra-long massage table (64x100) to ensure proper coverage for all clients. Available for wholesale purchase by the case of 24 massage table flat sheets. Choose from white, gray, camel and moss green colors to create a clean and inviting treatment room. Double Brushed for a smooth luxury peach-skin softness similar to high thread count, 100% cotton sheets. Ideal thickness to provide adequate cover for clients. Breathable and moisture wicking to keeping clients cool and comfortable. Test results show that Microfiber sheets last 50% longer than T200 cotton/polyester blended sheets. Bright white and Color fast colors: whites stay bright, colors don�t fade. Pill resistant (anti-pill) and stain resistant fabric for repeated use. Microfiber dries 30% faster than cotton blends saving time and energy cost. Uses less chemicals (20% less) and water (20% less) when washed to save on laundering cost. Wrinkle free when promptly removed from the dryer. No shrinkage: sheets are always the same size after laundering. Available in 4 colors: Camel, Gray, Moss and White. 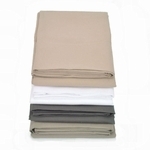 2 Massage Table Flat Sheet Lengths: Standard (64" x 94") or Extra Long (64" x 100").